Ss need to unscramble the sentences and conjugate the verbs properly. I use this after I've taught articles, present simple verbs in the affirmative and negative forms and time expressions. This ws can also be used as a timed game. The first pair of Ss to complete the ws, without errors, wins a prize. The present downloadable printable is a great resource for business/professional students, high school students, elementary school students and adults at Beginner (pre-A1) and Elementary (A1) level. 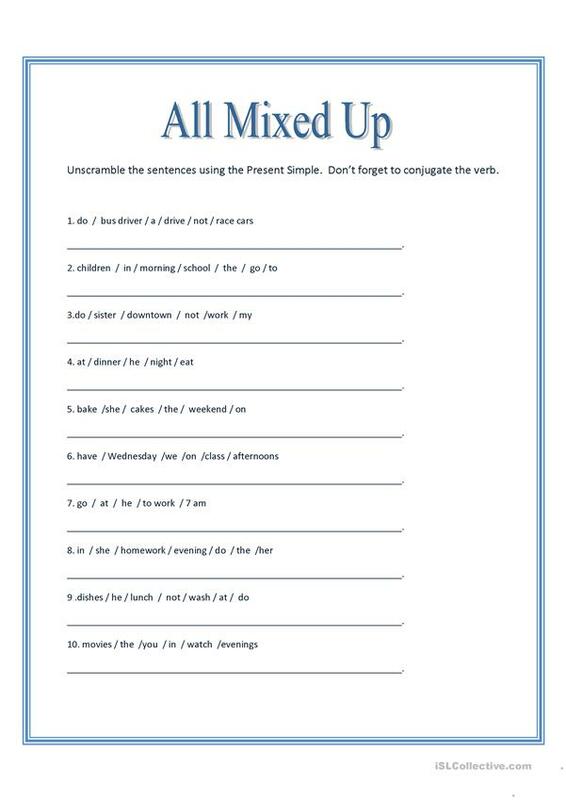 It is valuable for consolidating Present simple tense in English, and is excellent for strengthening your class' Spelling and Reading skills. It centers around the theme of Actions. picksychick is from/lives in Canada and has been a member of iSLCollective since 2011-05-14 18:04:17. picksychick last logged in on 2019-02-05 19:34:50, and has shared 15 resources on iSLCollective so far.